Plot synopsis: A travelling salesman who suffers from blackouts fears that he may be the killer known as the 'ABC murderer', as he cannot be sure that he has not murdered a series of victims - alphabetically by name - during the periods he loses consciousness. Based on a novel of the same name by Agatha Christie, first published in 1936. Plot synopsis: In planning the murder of his overbearing boss, a downtrodden bookkeeper sees an opportunity to steal $50,000, and at the same time remove a major obstacle to his daughter's happiness, as his employer has refused to allow her to marry his son. Plot synopsis: An ageing Shakespearean actor organizes a dinner party to expose the identity of the person who murdered his daughter. Based on a short story by Ben Hecht, first published in his short-story collection Actor's Blood, in 1936.
Review: Ben Hecht, the writer of this episode, was responsible for some of the greatest film screenplays of all time, for the likes of Scarface and Notorious, and he also penned a number of plays that later became classic films, including The Front Page (one version of which is the fantastic His Girl Friday). Yet Hecht not only wrote this episode, but also appears in it, which adds an unusual extra dimension to the broadcast. 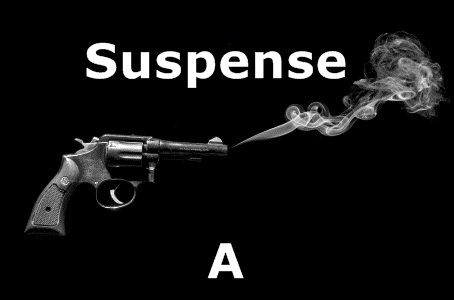 The story itself is reasonably exciting, though far from among Suspense's best. It appears initially to be an old-fashioned sort of thriller, centred on the quest to discover who murdered the protagonist's daughter, with the cast of suspects gathered together - in the manner of an Agatha Christie tale - at a dinner party to unmask the killer. However, there is an unexpected twist at the end, which makes it a much more interesting, and darker, episode than it originally seems. Hecht's presence in the radio play doesn't add much to the story, though; was this, perhaps, simply a case of author vanity? Plot synopsis: An American in British-ruled Yemen sets out to rescue the woman he loves from the men who have kidnapped her. Review: An old-fashioned sort of adventure story, this tale of a valiant American hero taking on dastardly natives and their backward ways - in this case, forced marriage - is of a type rarely made any more. Admittedly, my characterization here is perhaps a little unfair, as the episode is in fact quite respectful of the religion and culture of the story's Muslim 'villains', and they are not simply caricatured; indeed, interesting use is made of the Koran's teachings by the hero himself. The main problem with this episode, therefore, is not any simplistic stereotyping of the kidnappers, but that is just not very gripping. There are no real twists to the plot, and the action content is minimal. Overall, there simply isn't very much in this tale to get excited about. Plot synopsis: A man driving along an almost deserted road picks up a woman whose car has broken down, but they are soon forced to stop for the night by a violent storm - yet with a crazed killer somewhere in the vicinity, will they survive until morning? Review: Some episodes I give a low rating not because they are bad as such, but simply because they are very ordinary. This one is a case in point. The performances are fine and the script is adequate, but the plot is painfully mediocre. Everything is signposted right from the start - we are told that a killer is on the loose in the area, with further reports of his activities coming periodically, so it's pretty obvious (and I don't think this counts as a spoiler) that the story is going to culminate with the main characters encountering the murderer. I wasn't especially enamoured of the two leads, either - the woman in particular is quite irritating with her insipid, helpless-little-girl act - or their burgeoning relationship. Unless you are a Suspense completist, there's no real reason to listen to this episode when so many others are far superior. Plot synopsis: A man invites the four survivors of an elevator crash to dinner to discover which of them murdered his son during the accident. Based on a short story by Cornell Woolrich (writing as William Irish), first published in Black Mask magazine, in January 1938; and later in his short-story collection After-Dinner Story, in 1944.
Review: Despite making some small changes to the short story upon which it is based, this episode is quite a faithful adaptation of Cornell Woolrich's original. The story centres on two scenes: a frightening elevator crash in an office building and a 'dinner party' at which the host attempts to uncover the identity of the man who murdered his son during the accident. Both scenes, it has to be said, involve significant contrivances, and the listener must suspend a fair amount of disbelief to buy into the improbable plot. Indeed, to my mind, the story lacks the authenticity and psychological depth of Woolrich's very best tales, ones which don't rely quite so much on the 'gimmicky' twists that this one does. Yet at the same time, this is a fine example of its type, with plenty of thrills and suspense, good performances and a clever resolution in which the killer is unmasked by exploiting his sense of guilt. Plot synopsis: A juror on a murder trial finds an envelope containing a $10,000 bribe on the floor of a drugstore, bringing him and his wife into contact with a gang of murderous gangsters. Based on an original story by Jack Finney. Review: Some episodes can be entertaining and enjoyable even if they have definite weaknesses, and this is a good example of one. There is a fine first act, which sets the stage for a solid thriller; and the final act is also strong. However, in the middle, the story sags quite a bit. Furthermore, many of the secondary characters are little more than stereotypes, especially the two gangsters, who are simply walking clichés. I'm not convinced by the title, either: yes, in a literal sense, the story does begin after the main characters have been to the movies, but this isn't of any great relevance to the plot. Even so, the surprising - even shocking - denouement does serve to make up for any deficiencies, providing a memorable sting in the tail.